On this day in Duluth in 1905, automobile enthusiast Edward J. Filiatrault told the Duluth Herald that the beach along Minnesota Point would make for an automobile race equal to the one at Florida’s Ormond Beach—better known today as Daytona Beach. 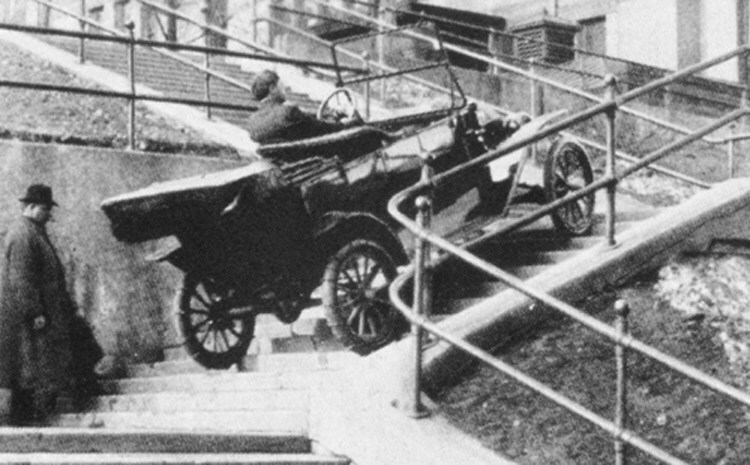 Filiatrault was the self-promoting owner of the Mutual Electric and Auto Company, whose car was the first to cross over the Duluth Ship Canal on the Aerial Transfer Bridge, and subsequently the first to drive on Park Point as well. (We also assume then that he was the first driver in Duluth to get “bridged,” as until 1930 everyone had to wait for the gondola car in order to cross.) Founded in 1901, Mutual Electric and Auto was Duluth’s pioneer car dealership. Filiatrault drove a Studebaker-Stanhope, a lightweight electric car that unlike its heavier, internal-combustion competitors, was not so heavy that it would bog down in beach sand. With a little investment, Filiatrault said, Duluth could develop a “road 50 to 60 feet in width, perfectly level, and stretching for a distance of seven miles along the lake shore…. All that needs to be done to put the beach in perfect condition is a few days’ work by four or five men, clearing driftwood.” Since Duluth’s climate was more pleasing in the summer, Filiatrault argued that “[Florida] could have the winter races down there if they would let us hold the summer races here. Despite Filiatrault’s claim that he heard an unnamed citizen say he “intended to take it up with the Commercial Club and urge some immediate action on the matter,” the beach along Minnesota Point never became home to a national road racing course.